Hello friends! I am so excited to share a REALLY fun project that I created! I had THE best, (and slightly messy) time creating these funky houses. I like to embrace the mixed media craze in small doses. As an art major in college, I spent a good part of my time covered in paint, gesso, clay, photography chemicals, and other assorted materials. I can get MESSY. But it also makes me crazy after a while, and I'm happy to go back to paper and ink. 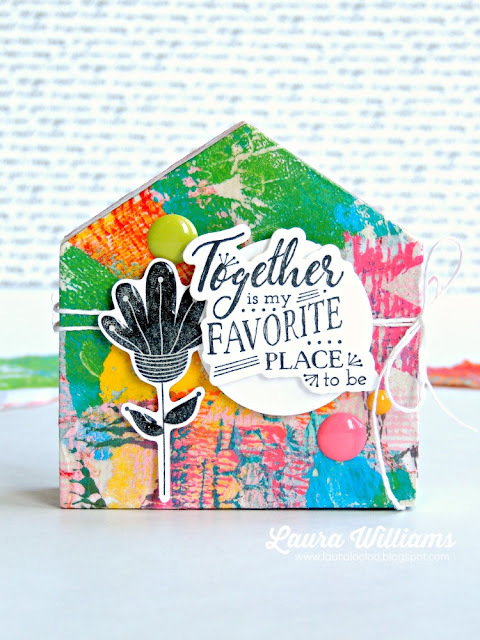 To create these houses, I started with the bare wood House To Home Trio from Fun Stampers Journey. I used two of the three houses included in the set. First I applied a thin base coat of Whip Cream acrylic paint. While it dried, I started creating my printed tissue with the Gel Press. Printing on tissue paper is a little delicate, because depending on the thickness of the tissue, sometimes it wants to rip once its saturated with paint, so pulling prints needs to be done slowly and carefully! To begin, I used shades of blue and green paint, and applied them to the Gel Press. 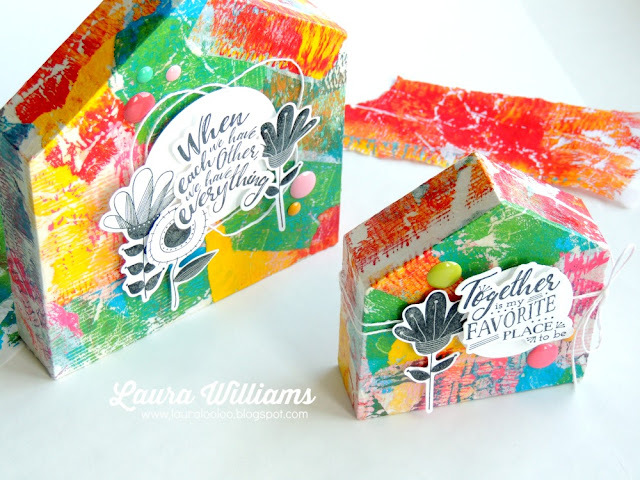 I used the brayer to mix and spread the paint evenly. Then I used stamps, stencils, and a scrap of corrugated cardstock to add some texture. Once the tissue papers were dry, I started tearing them into pieces, and applied them to the houses using Journey Gel Medium. The medium dries clear, so I painted it directly onto the house, stuck the tissue pieces down, and painted over it to seal it all. Next, I stamped the flowers and sentiments from FSJ's Chosen Family stamp set, onto Whip Cream cardstock, detail cut, and then layered them onto the houses, along with some Whip Cream Journey Thread. 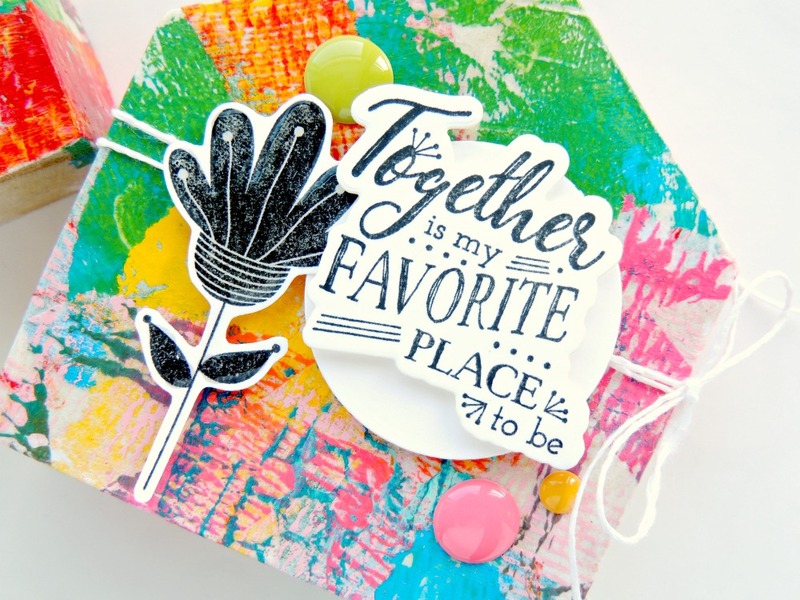 Some Sweet Candy Drops and Journey Glaze are pretty much ALWAYS the right finishing touch. The fun part - and the scary part - of working with the Gel Press, is that you often don't really know what you'll end up with. As I've played and explored with this new-to-me tool, I've made a lot of ugly mess...but I've made a lot of really cool prints too. Being okay with making UGLY is important in developing your creativity. Sometimes the PROCESS is as important as the finished PRODUCT. Be willing to take a risk, and have fun! By the way....now is the perfect time to take the plunge and be BRAVE. 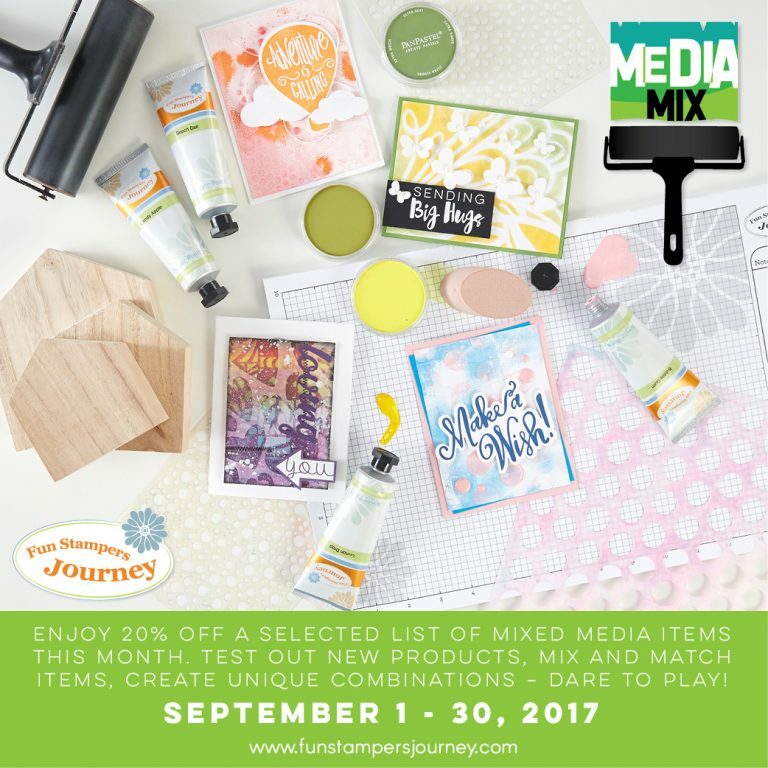 This month there's a big sale on mixed media goodies at FSJ. Are you feeling intimidated by the Gel Press? Or, quite honestly, have you never heard of the Gel Press? 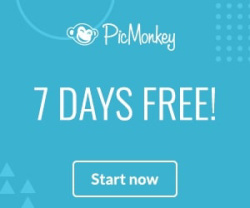 (It's okay - it was new to me too!) Check out my Mixed Media Pinterest board. I've been pinning all sorts of cool ideas, and tutorial videos that I've learned a LOT from. 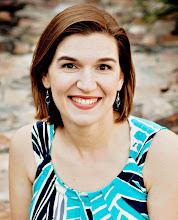 They might just be the perfect introduction and inspiration for you! Also, be sure to stop by the Fun Stampers Journey blog for more information about this month's promotion - AND Media Mix inspiration all month long! I'm so glad you stopped by today! Now, go do something messy and creative!!! PS. 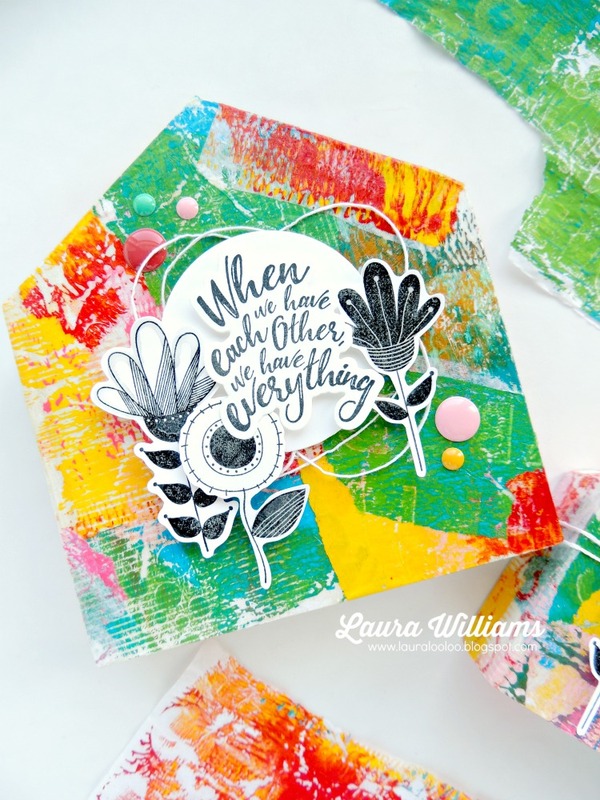 If you get in on the mixed media action, (and I hope you will) post your projects online with #fsjmediamix to share the fun! I love your houses! Thanks for sharing. I've been wanting to try my FSJ Gel Press with some deli paper that's been in my stash for a while. 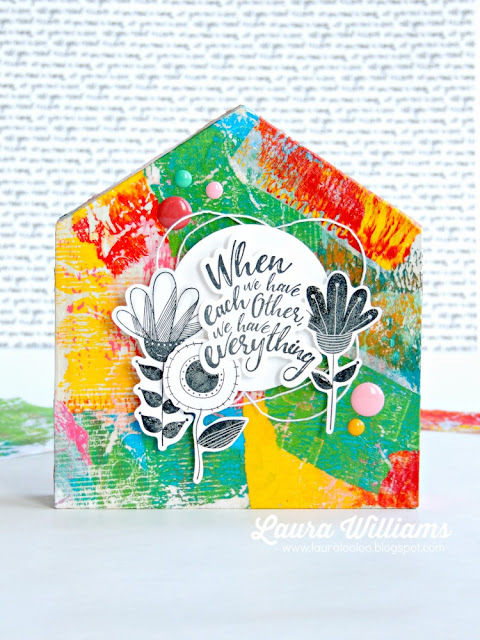 Whoo hoo love your houses Laura!!! These are just gorgeous...so bright and happy!